A few years back, I wrote a critique of the appalling miscarriage of justice inflicted upon "Gossip Girl" actress Kelly Rutherford in the custody battle for her children. Now, almost three years after her American-born kids were whisked out of the United States to live with their deported dad, the situation has somehow become even more surreal with a French court thumbing its "nez" at the U.S. court ruling that set it all in motion. A quick refresher: Rutherford's ex-husband Daniel Giersch, a German citizen, was refused re-entry to the United States after a trip abroad. No one seems to know exactly why. People magazine reported he was accused of "dealing drugs and weapons," while an affidavit presented in the case accused him of fraud, but whatever the reason, he did something serious enough to immediately lose the right to remain in this country. Somehow a California family court judge determined (over the objection of the lawyer representing the children) that their two American citizen kids, Hermes then 5, and Helena then 2, should get exiled too. No, Rutherford wasn't accused of any wrongdoing. In fact, the judge agreed that Rutherford had been an excellent parent, but nevertheless felt that it would be in the "best interest" of the children for them to be in one place -- even if it was outside the United States -- rather than having them fly to see their peripatetic papa. Giersch eventually made his home in a small town in France, so now you have two American citizen children living with their German father by California court order, in France. Kelly Rutherford, son Hermes, and daughter Helena walk the runway the Fendi Kid's SS11 Domestic Debit Fashion presentation on April 14, 2011 in New York City. As I said at the time, "Amazingly, the legal question was whether the children of a loving American mother should be forced to live in a country where neither parent has citizenship because their father had done something that made him ineligible to remain in the United States." The inexplicable California ruling both in 2012 and in a later updated order made one thing perfectly clear, the kids are to remain United States residents and California is to be their "home state." The ruling stated in part: "The court intends that each child's habitual residence will remain the United States and any foreign travel or stays in other countries will be temporary in nature and not result in a change of either child's habitual residence or jurisdiction to modify custody and visitation orders or issue new custody and visitation orders." It was supposed to be "temporary," because one of the most critical stipulations required Giersch to continue to seek a new visa so he can return to the United States with the children. So how's that going? Late last week a State Department official confirmed that to this day they "have not received a visa application for Mr. Giersch." In theory, that should mean big trouble for Giersch and the likelihood of a new ruling in Rutherford's favor. After all, the California judge also required that Giersch get a French court to issue a ruling that would "mirror" that of the California court. 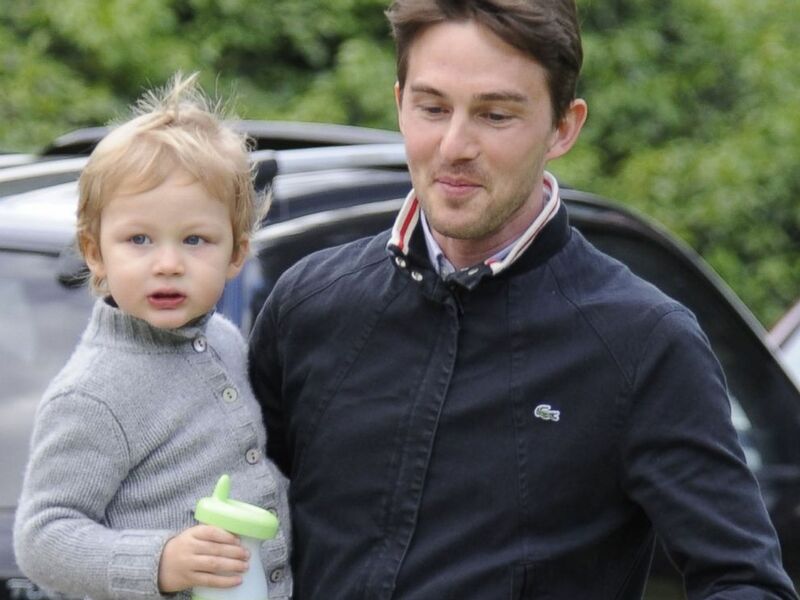 Kelly Rutherford's husband Daniel Giersch and son Hermes Gustaf Daniel Giersch sighting on April 7, 2009 in Beverly Hills, Calif.
"Father must act forthwith through French counsel obtain 'mirror orders' in France and Monaco recognizing and adopting all of the findings in terms of this further judgment for enforcement only (expressly providing that neither France nor Monaco will modify the orders here in and expressly deferring to California's exclusive continuing jurisdiction) in France and Monaco unless and until this further judgment has been superseded by a subsequent order of this court or further judgment," the ruling said. So one could argue that maybe there's hope for Rutherford now unless, of course, the French court ignores the California ruling, which is exactly what happened. A Monaco court determined that the "mirror" judgment mandated by the California judge is "unknown" to their "legislative framework" and so that "application should be declared inadmissible." Most troubling, the Monaco judge ruled: "We establish the permanent residence of the minor children Hermes and Helena Giersch with their father Mr. Daniel Giersch." Translation of the translation: we don't really care what they said in California, those American children have now been declared French residents. So why should or would Giersch obey the California court's orders? Back then I warned: "While Giersch is also required to continue to attempt to seek a new U.S. visa (and Rutherford has been ordered to help), it is a stunningly unrealistic ruling and whatever restrictions the judge imposes are totally unenforceable in French courts." Not surprisingly, it now seems that Giersch is increasingly preventing the children from traveling to the United States to visit Rutherford (in fact, she is in France with them right now). The California court schedule had the kids coming once in February and again in April, but the Monaco judge reduced that to only times when the children have "more than a week" off from school. Giersch has, according to Rutherford, now refused to allow for those previously required visits. That temporary arrangement in the "best interest of the children," increasingly seems permanent, with Rutherford getting less and less time with her American children and no change is in sight. So why wasn't Rutherford challenging or appealing the rulings in real time from Monaco and California? Well, primarily because she's broke. Rutherford filed for bankruptcy in 2013 after spending millions on legal fees (an issue I addressed in a separate piece) and travel to France well beyond what Giersch was required to cover. Her new lawyer Wendy Murphy, taking the case pro bono, says she believes its an issue for the federal courts to resolve, arguing that these American kids' constitutional rights were violated when they were shipped out of the United States. Kelly Rutherford (R) and husband Daniel Giersch arrives at the People's Choice Awards 2010 held at Nokia Theatre L.A. Live on Jan. 6, 2010 in Los Angeles, Calif.
She lost round one, with the district court calling it an "impermissible attempt to embroil the federal courts in matrimonial matters best left to the state." Murphy appealed and argued in front of the federal appeals court earlier this month. Convincing any federal court to step into a custody battle won't be easy, but the appellate judges seemed flabbergasted that the assistant attorney general arguing against Murphy didn't even know why Giersch was booted from the country. I have not been able to find a single case anywhere in the United States quite like this one and in the appellate argument, the government seemed to miss this crucial point. They argued, "this is far from the first case where a parent of U.S. citizen children seeks to reside outside of the United States, and where state courts adjudicating custody permit or direct that to occur." But, of course, this is not about one parent who "seeks to reside" out of the country with her or his children. It is about a non-U.S. citizen parent getting kicked out the country, failing to "seek" to return as mandated by a U.S. court, and keeping those U.S. resident children with him in exile. Regardless of the legal outcome, the State Department (the same one that confirms Giersch has not applied for that visa) seems the obvious place to help take action now, before Rutherford loses more time. They wouldn't be asked to step on a state court ruling, but just to try to enforce it. The case for them is pretty straightforward: A California state court ruled that two U.S. citizen children must remain U.S. residents, their "home state" California, despite "temporarily" living in France. Now in direct violation of that ruling, those U.S. children have been declared French residents and prevented from coming home to the United States as mandated by that California court. So putting aside why Giersch's visa was revoked in the first place, and ignoring the insanity of the California ruling for a moment, that rebuke of the California judgment in and of itself, should be sufficient cause to lead the State Department to act. So will they? A State Department official says: "Due to privacy concerns, the Department has no comment on this specific custody case. In general, the Department of State does not have the authority to enforce U.S. laws in other countries." Right, except that the question isn't about "authority" but will -- the will of the State Department to try to vindicate the rights of an American mother and her two American children as they have in other international custody cases involving U.S. citizens. One has to wonder to whether Rutherford's celebrity is actually working against, yes against, her. Sure, her case has received attention from media outlets that would not otherwise care, but if Kelly Rutherford were just another now basically broke mom trying to get her American kids back home under similar circumstances, I have to believe the patriotic and emotional outrage would be deafening. German husband gets kicked out of country and takes American kids with him -- to France? Think Kelly Jones. Frantic, loving, single mom just trying to get her kids back home. Maybe then she becomes one of those exceptions to the State Department's "general" policy. Dan Abrams is ABC News' Chief Legal Analyst.